Kanchan Bhatt did her Bachelors and Masters in Environmental Science. She then went to Melbourne to do an MBA in Marketing Management. She returned to India and worked with Event Management companies for 8 years. 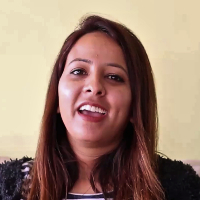 In 2017, she moved back to Dehradun and started her own event management company called Alive Events and In 2018, she also started a Media Publication House called Doon Page-3. Media and Publications include weekly and quarterly news services, industry directories, multi-client studies and thought leadership pieces across the agribusiness, investment and gender diversity space. "I did Bachelor's and Master's in Environmental Science from DAV PG College. I then went to Melbourne to do an MBA in Marketing Management from La Trobe University, Melbourne. I returned to India and worked with Event Management companies for 8 years. In 2018, I started my own firm called Doon Page 3 which is a Media Publication house." "I did Bachelors and Masters in Environmental Science from DAV PG College. I then went to Melbourne to do an MBA in Marketing Management from La Trobe University, Melbourne. I returned to India and worked with Event Management companies for 8 years. In 2017, I moved back to Dehradun and started my own event management company called Alive Events."